Give yourself a moment to contemplate luxury and style with the contemporary glory of the Toga Rope Aluminium Dining Chair. A stunning collection of materials highlights an already terrific design, taking influence from mid century modern furniture and propelling it into the now with a striking colour palate, and divine texture. The Toga Rope Dining Chair features a splendid curved back with vertical wrapping of outdoor rope forming a comfortable and very attractive chair. The legs boast a simple sleigh design, which is light and airy, and the soft grey Sunbrella® cushion keeps you in utter luxury for hours at the dinner table. Test out this stunning item in situ around a big, bold teak dining table from our collection – a superb mix of contemporary and classic for your outdoor dining experience! Perhaps the Toga Rope Chair is best suited to your sleek concreted pad with matching concrete dining table – a sophisticated urban setting you will adore! This gorgeous and unique chair can also contribute to a superb indoor dining set – mix and match with many different styles to find what works best for you! Made from amazing outdoor materials, the Toga Aluminium and Rope Dining Chair is a wonderful piece to contribute to your outdoor setting. A frame that is entirely powder coated aluminium in chic graphite is not only tremendous to look at, but protects your furniture from the changing elements. Our fabulous outdoor rope is dyed with extra UV protection that makes it robust, long lasting and very comfortable. The final flourish is the Sunbrella® cushion with QuickDry® foam – a much desired product for exterior use. 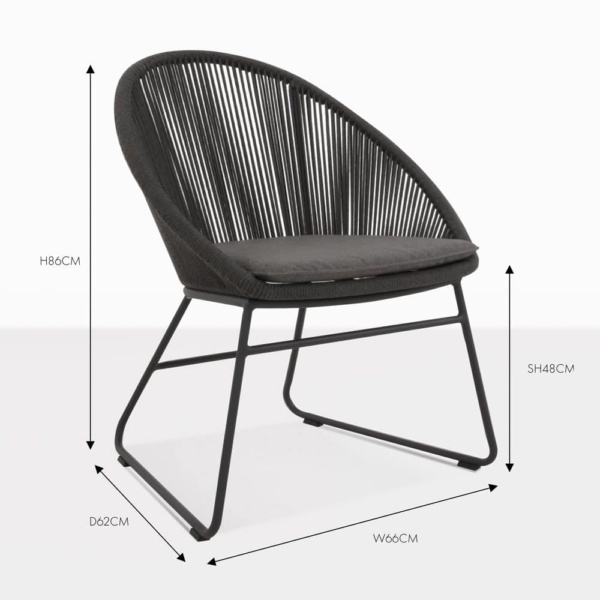 The Toga Dining Chair is just one of many styles of fabulous outdoor chairs for the dinner table from Design Warehouse. Toga speaks to all things modern – so if you’re looking to transform your space. Call us today!